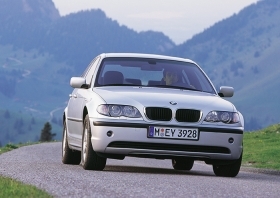 BMW sold 73,395 3-series models during the first nine months of the year, a 9 percent increase over the same period in 2009. The new Cadillac model that General Motors announced today will be aimed at the smaller models produced by BMW, Mercedes-Benz and other luxury brands. The rear-drive Cadillac is expected to be called the ATS and arrive in showrooms in 2012 or early 2013, according to industry sources. The car also will compete against the BMW 3 series, he said. Akerson made the announcement at the automaker's Lansing Grand River assembly plant in Lansing, Mich. GM plans to spend $190 million to modify the plant to build the ATS. A second shift and 600 jobs will be added. The timing for the second shift and the additional employees was not announced. GM also did not identify the name for the car or give the time frame for production. Joe Ashton, UAW vice president of the union's GM department, said “the UAW recognizes the paramount importance of innovation, flexibility and partnership with management to respond to global economic pressures. “We are proud to play our part in the turnaround at GM. Our mission is to make the highest quality products for the best value,” Ashton said in the news release. The plant currently assembles the Cadillac CTS and STS. Since emerging from bankruptcy in July 2009, GM has announced investments totaling more than $3.1 billion in 21 U.S. plants. Last year, BMW sold 90,960 3-series models in the United States, a 19 percent drop from the previous year. But for the nine-month period this year, BMW sold 73,395 3-series models, a 9 percent increase over the same period in 2009. The ATS and the upcoming XTS sedan are part of Cadillac's plan to position the brand as a full-line luxury brand. The XTS will share a front-drive platform with the Buick LaCrosse and other GM models. It will debut in 2011. A larger, rear-drive Cadillac that would rival the Mercedes-Benz S class and BMW 7 series in pricing is planned later in the decade. Cadillac sold 105,013 vehicles during the January through September period, a 44 percent increase over the same period in 2009. The automaker sold 109,092vehicles in 2009, a 32 percent decrease over the previous year. The ATS will be developed on GM's new rear-drive Alpha vehicle platform. The platform will be used for a range of ATS models -- a sedan, coupe, convertible and possibly a wagon, Hall said. GM also expects this smaller Cadillac to be more acceptable as an export model, he said. The Alpha platform also will be stretched to develop the next-generation CTS. That car is expected to debut in 2013 or 2014. The platform will not be unique to Cadillac. The next-generation Chevrolet Camaro will share the platform in 2014 as well as a possible sporty, high-performance Chevrolet sedan that is under consideration. Prior to GM's bankruptcy and the elimination of brands, a Pontiac model also had been slated to share the platform. LANSING, Mich. – General Motors today announced a $190 million investment in its Lansing Grand River assembly plant for the production of a new Cadillac model. The investment will create 600 jobs and result in the addition of a second shift. The announcement brings the total of new U.S. investment to more than $3.1 billion and more than 7,900 jobs that GM has created or retained in 21 U.S. plants since emerging from bankruptcy in July 2009. Built in 2001, Lansing Grand River is GM's second-newest U.S. assembly plant and the manufacturing home of the Cadillac CTS and STS as well as their V-series performance versions. Earlier this year Lansing Grand River received the J.D. Power and Associates Bronze Plant Award for initial quality. The timing of the new Cadillac and the new jobs as well as the start of the second shift will be announced later.